Located in the Forest of Dean, The Speech House Hotel is ideally situated for access to a large variety of activities such as; Go Ape, Off Road Driving, Canoeing, Walking, Cycling, Caving, Shooting… or you may just prefer having a quiet afternoon tea! 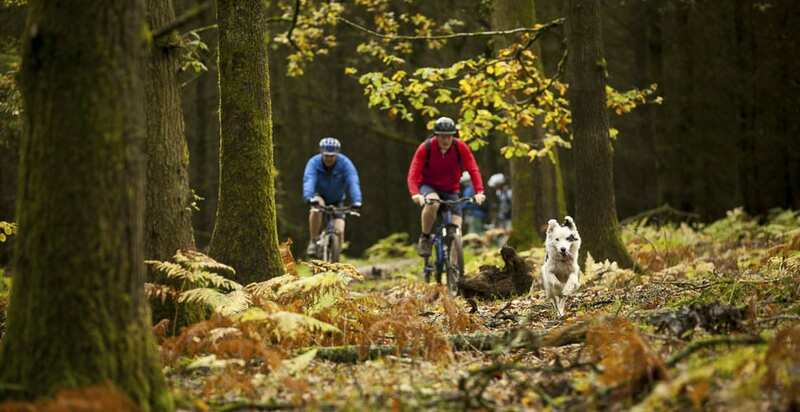 With so many opportunities to walk in the Forest of Dean, if you have a dog, it would be a shame not to bring your ‘best four legged friend’ along. The Speech House Hotel is proud to say that it is a dog friendly hotel, and that guests have a great opportunity to go on holiday with their dogs, and stay in pet friendly accommodation. Here’s a few of our favourite walks and activities. The Forest of Dean Sculpture Trail is located directly opposite The Speech House Hotel. 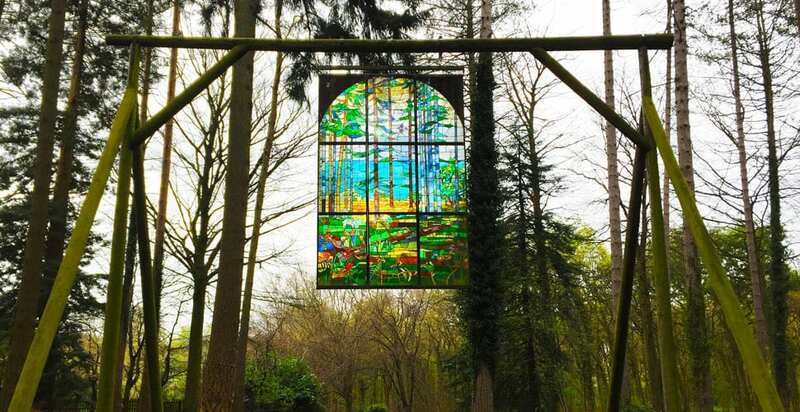 Don’t be surprised if you stumble across a huge hanging stain glass window, or even a giant wooden chair, this unique walking trail is unlike any you have ever seen before. The 4 mile trail was set up nearly 30 years ago as a project designed to bring art into nature. Inspired by the Forest, artists produced 28 sculptures, 17 of those sculptures can bee seen on the trail today. 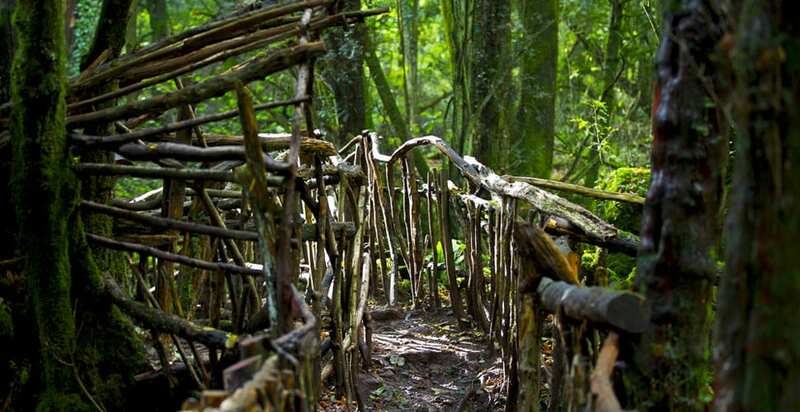 Located just a 10 minute drive from the Speech House, Puzzlewood is an enchanting and magical forest. In fact Puzzlewood is said to have inspired JRR Tolkein in his descriptions of Middle Earth in The Lord of the Rings. The location has also been used as a film set for many movies and TV programmes, including Star Wars, Dr Who and Merlin. Finding hidden doors and paths amongst the unique tree and rock formations is one of the many features that makes Puzzlewood special. Not only could you spend a couple of hours exploring top to tail, but Puzzlewood also has its own petting zoo, wicker maze, picnic spots and a cafe. 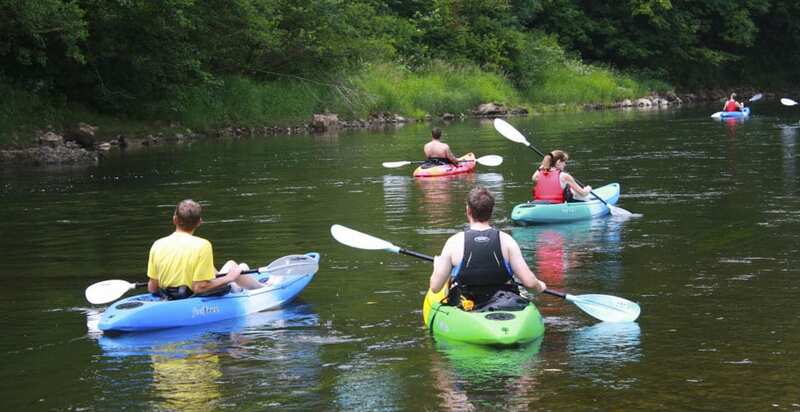 Whether it’s running the rapids at Symonds Yat or just taking a lazy cruise through the stunning scenery of the Wye Valley, this an an experience not to be missed! Venture out and explore with canoe hire or take a guided tour that includes a specific route and a guide. Both are available from Way 2 Go Adventures just a short 10 minute drive from the Speech House. 4 x 4 off road driving experience at Whitecliff located in Coleford is only a 10 minute drive away from The Speech House. Whitecliff have 4×4 driving for everyone with courses from an introduction to Off Road Driving to Professionals, Groups to Juniors or even Adrenalin 4×4 experience you’ll never forget. Whitecliff have a private 4×4 off-road driver training site, with its variety of surfaces is one of the best in the UK. It offers a spectacular scenic environment with terrain & obstacles ranging from flat slippery surfaces, to cross-axle situations, mud, water (weather permitting) and from moderate to steep inclines & declines. Find out more about Whitecliff here. The Verderers Trail is a 7 mile cycle route starting and ending at the Speech House Hotel. This is an adventurous and exciting trail for intermediate and experienced cyclists. With a combination of different cycle surfaces, moderate climbs and beautiful views of the Forest this trail can be adapted for anyone with 2 shortcut routes avalible if 7 miles seems too daunting. The Freeminers Trail is for experienced riders only and is suitable for off-road mountain bikes. This route is a 4.5 mile long single track that offers something to challenge even the most demanding of riders including tricky switchback climbs, rooty drops and hairpin bends. The new extension includes some fast flowing sections, table tops and technical climbs thrown in to keep you entertained. The Family Trail is an 9.5 mile circular route that is mainly on former railway lines with connecting routes to villages and picnic sites. This route has been especially surfaced and is suitable for all ages and abilities. It is possible to start this route from The Speech House. It will take you along the old Severn and Wye railway line, passing former railway stations at Drybrook Road, Cannop Wharf. Remnants of former coal mines can be seen at Foxes Bridge, Lightmoor and New fancy. Enjoy two to three hours in the trees taking on Zip Wires, Tarzan Swings, Rope Ladders and a variety of obstacles and crossings. Go Ape is just a 10 minute drive from The Speech House. 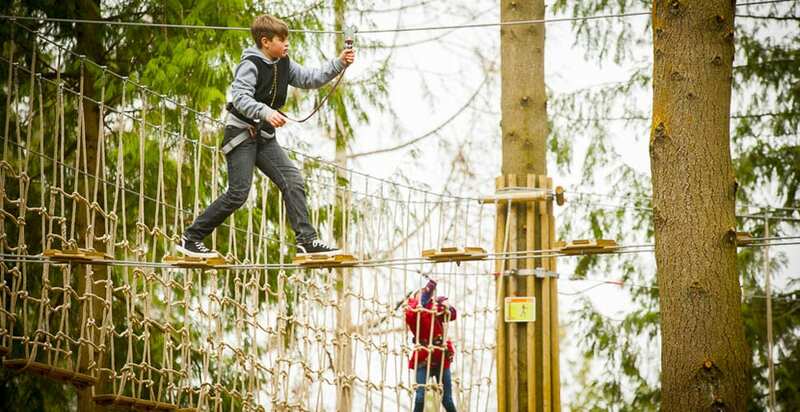 And if you’re looking for outdoor activities for children, the Tree Top Junior Adventure is just three miles down the road at Beechenhurst Lodge. Find out more about what you should ‘Know before you go’ by clicking here. Located just 10 minute drive from The Speech House are the Clearwell Caves, one of the most complex and ancient cave systems in Britain. 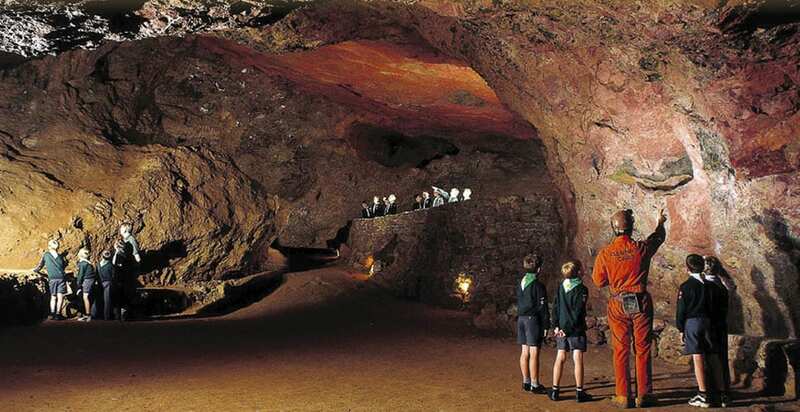 Clearwell Caves is a working mining museum where you see the impressive and atmospheric caverns the iron miners made. There are 9 large caverns are open to the public with displays throughout telling the miners’ story from the Stone Age up to the present day. Iron ore from the Caves has made tools, weapons and machinery over the centuries, but iron ore also occurs as ochre powders that is used to make artists’ pigments. Red, yellow, purple and brown ochre are still mined here today. If you would like to visit the Caves during your stay at The Speech House, Click Here to view there opening times and prices. Are you a complete beginner to clay shooting, who has never even picked up a gun before, let alone blasted a target to pieces? Or are you a gun slinging expert, who spends every waking moment on the shooting range perfecting their accuracy and speed? Well just a 15 minute drive from the Speech House is The Big Shoot, the biggest Clay Pigeon Shooting network in the UK. The Big Shoot have a range of thrills tailor made to suit the needs of clay shooters regardless of their skill level. Click Here for more information and prices at The Big Shoot.